Ever since I first heard, and thereafter frantically and gushingly (yuk?) wrote about, Metome's 'Water Cycle' I've been hooked by his sound. Hooked ON his sound. 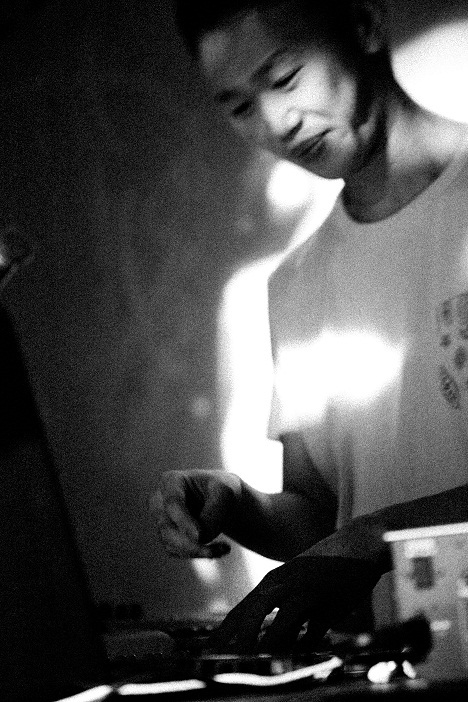 Real name Takahiro Uchibori, he's a Japanese producer and DJ who makes some pretty sumptuous music. And when I say pretty sumptuous, I mean downright delectable. He is a complete whizz-kid at chopping up vocals samples and creating different rhythms with these truncated vocals, often caught mid-breath, mid-word and often unintelligible. He uses them like an instrument, making the noises glitch and stutter to create a new and alien language that winds alongside smart, sometimes-clinical beats. 'Water Cycle' was like this, if you need an example. He creates blissful atmospheres, not always chopping up samples, but taking lines of sung vocal or instrumental samples and letting them breathe organically - for instance, his 'Take This Love' (also written for Dummy magazine) is just perfect in this case. As is the stunning atmosphere of 'Rain Comes From Clouds'. What's clear is that he is a very talented guy. Already making waves in Japan, notably in the Tokyo electronic scene, there is no reason that - given a little more coverage from larger publications too blinded by the general proclivities of well-established acts - he couldn't be rather a lot bigger and better known than he is. However, these things take time I guess. Anyway, Mr Metome was kind enough to fire back some answers for the Lazy Interview series - so have a quick read and learn a little bit about what makes him tick. Hi, I'm making music as metome and live in Osaka, Japan. It might be quite recent that I intended to make music by myself. Till then, I made music vaguely. I think it has been 3 or 4 years since I started to make music as an artist. I think that music is the most personal thing compared to other creative things such as music, fashion, architecture, etc. It might be a little hard to explain my sound. It doesn't mean my music is hard to listen to, because I think I pick up a lot of different music and mix it up to make my music. If it isn't talking about a genre of my music such as electronica, jazz, funk, bass, rock and more, then I think my music is pure and romantic. Well... home, outside, club, or many places, but I choose music which fits the atmosphere of a place. There are a lot of things that inspire me. It could be music of different kinds of genres or also it might be nature or love. I just remember that there was a Japanese drum class at a shrine near my house and I joined it. I stopped going there after 6 months but it was my first time to play an instrument. I respect all people who make their music having their own world views. In your opinion, what is the future of music/your music? The future of music... Now different kinds of music all over the world are mixed through the Internet. I think we are gradually heading to the world where people are united more, or get closer to each other. However in this situation, it is a fact that music which focuses on or shows where it comes from or its own original culture gains acclaim. I have a feeling of worry and hope for the situation that things are heading into one union (integration) as much as possible through the Internet. What I care about the most when it's music is expressing myself; effort and love. As for Metome himself, it's obvious that he loves what he does. He talks about his inspirations being love; love being important to him; music being the most personal creative avenue you can go down. He may well be right. The loving way in which he treats his songs is evidence of this - I may have even said these exact words in reference to Metome somewhere else before. But that's just it. His is a labour of love, and often it turns out that those kind of labours yield the best results, not only for his own sense of achievement, but for the joy of his audience, for the contentment of our ears as his sounds caress them. Thankfully, there's an EP on the way so we have that to look forward to.